Michael Stephen Lolich (born September 12, 1940) is an American former professional baseball player. 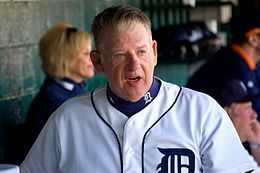 He played in Major League Baseball as a pitcher from 1962 until 1979, most notably for the Detroit Tigers. He is best known for his performance in the 1968 World Series against the St. Louis Cardinals when he earned three complete-game victories, including a win over Bob Gibson in the climactic Game 7. Lolich is one of only 21 major league pitchers to have struck out at least 2800 batters in his career. He is of Croatian descent. 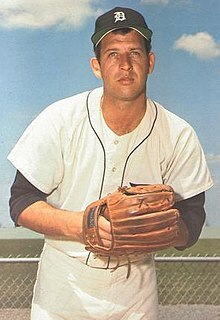 Lolich was signed by the Detroit Tigers as an amateur free agent in 1958. After five seasons in the minor leagues, he made his major league debut with the Tigers on May 12, 1963 at age 22. He blossomed in 1964 with 18 wins and 192 strikeouts in his first full major league season. In 1965, he fell to 14-14 but improved with 226 strikeouts, second best in the American League behind Sam McDowell. In 1967, the Tigers hired former major league pitcher Johnny Sain as their pitching coach. Sain helped develop Lolich's pitching skills and taught him psychological aspects of pitching. The 1967 season was a memorable one for the tight four-way pennant race among the Tigers, the Boston Red Sox, the Minnesota Twins and the Chicago White Sox. On July 25, Lolich was called to active duty with the Michigan Air National Guard in response to ongoing riots in Detroit. Lolich, a staff sergeant, spent twelve days on active duty. Upon returning to the team, he received death threats, allegedly from the Black Panthers, for his role in quelling the riot. In response, the Federal Bureau of Investigation placed a team of snipers on the roof of Tiger Stadium during his following two starts. The Tigers were in contention until the final day of the 1967 season, finishing one game behind the Red Sox. Lolich finished 14-13, but led the league in shutouts with six. In 1968, the Tigers quickly rose to first place, winning nine straight after losing the season opener to Boston. Lolich was overshadowed by teammate Denny McLain's 31-win season, and was sent to the bullpen in August due to a late-season slump. He made six relief appearances before returning to the starting rotation. He posted a 17-9 record with 197 strikeouts, as the Tigers won the American League pennant by 12 games over the second-place Baltimore Orioles. After Bob Gibson had defeated McLain in Game 1 of the 1968 World Series in St. Louis, Lolich helped the Tigers recover by allowing only one run to win Game 2 by a score of 8-1. He also helped his own cause by hitting the first and only home run of his 16-year career. But the Tigers lost the next two games at home to fall behind the Cardinals 3-1 and were facing elimination when Lolich returned to pitch in Game 5, just four days after pitching a complete game. Despite an unsettled start, when he surrendered a two-run home run to Orlando Cepeda in a three-run first inning, Lolich remained calm and proceeded to pitch eight scoreless innings as the Tigers scored two runs in the fourth and took the lead in the seventh on Al Kaline's bases loaded two-run single. They added another run for a 5-3 win, staving off elimination. Back in St. Louis, the Tigers then won Game 6 behind McLain's solid pitching and a grand slam home run from Jim Northrup in a Series-record-tying ten-run third inning rally to force a crucial Game 7. With just two days of rest, and having pitched two complete games in the past seven days, Lolich faced Gibson in Game 7, both having won their previous two starts. They each pitched six scoreless innings, Lolich picking off baserunners Lou Brock and Curt Flood to end a Cardinal threat in the bottom of the sixth, before the Tigers broke through with three runs in the top of the seventh starting with a two-out, two-run triple to deep center by Northrup just over Flood's head for an eventual 4-1 Tiger win and a 4-3 Series triumph. Detroit became only the third team in World Series history to rally from a 3-1 deficit to win in seven games. Having completed game 7, Lolich became the 12th pitcher to win three games in a World Series, and the last with three complete games in a single Series. He was the last pitcher with three wins in the same Series before Randy Johnson in 2001 for the Arizona Diamondbacks. Lolich's performance earned him the World Series Most Valuable Player Award. Lolich was consistent throughout his career, winning 14 or more games for ten consecutive seasons, reaching 25 victories in 1971 (which no Tiger pitcher has since matched) when he led the American League and 308 strikeouts (also a Tiger record to this day). Lolich pitched a career-high and MLB-leading 376 innings in 1971, finishing as the AL Cy Young Award runner-up. He won 22 games and posted a career-best 2.50 ERA in 1972, helping the Tigers to the American League East championship that season and finishing 3rd for the AL Cy Young Award. The Tigers bowed to the eventual world champion Oakland A's, three games to two, in the American League Championship Series. Lolich pitched superbly in both of his ALCS starts, but did not earn a win in either game. In Game 1, he pitched 10 innings of 1-run baseball before losing the game in the bottom of the 11th on an unearned run. He pitched nine innings in Game 4, again allowing only 1 run, but the win went to reliever John Hiller as the Tigers rallied in the 10th inning. Lolich as a member of the Detroit Tigers in 1975. Lolich struck out 200 or more batters in a season seven times in his career, and ranks fourth among left-handers (behind CC Sabathia, Steve Carlton and Randy Johnson) in career strikeouts with 2,832. After suffering through the 1975 season, in which he lost 18 games for a declining Tiger team, he was traded to the New York Mets with outfielder Billy Baldwin in exchange for star outfielder Rusty Staub and pitcher Bill Laxton. Despite posting a decent 3.22 ERA for the Mets in 1976, Lolich went 8-13 and retired after the season. He opened a doughnut shop in suburban Detroit and sat out the 1977 season. He returned to baseball in 1978, signing with the San Diego Padres as a free agent. He pitched mostly in relief for the 1978 and 1979 Padres teams before permanently retiring, holding at that time the major league record (and still the AL record as of the end of the 2012 season) for most career strikeouts by a southpaw. He was originally right-handed all the way, but a tricycle accident in early childhood forced him to throw left-handed from older childhood on. He batted right-handed and still writes with his right hand. He ran his doughnut shop in Lake Orion, Michigan (a small suburb roughly 24 miles north of Detroit) for several years before he sold the business and retired. He is still active in charity work, and serves as a coach at the Detroit Tigers' fantasy camp in Lakeland, Florida. Because of his humble "everyman" qualities, many long-time Tiger fans celebrate him as one of the most popular sports figures in a working man's city. As The Detroit News put it, "He didn't act like a big shot superstar, he was one of us." In 2003, Lolich was one of 26 players chosen for the final ballot by the National Baseball Hall of Fame's Veterans Committee but garnered only 13 votes, far below the 75% required for election. A frequent claim of his is that never having won the Cy Young Award was a factor in his lack of success in Hall of Fame balloting (as of 2012). His 2,679 strikeouts is the second-most in AL history by a left-hander. His 2,832 career strikeouts in both leagues ranked in the top 10 in major league history when he retired in 1979. His 1,538 batters faced in 1971 was the most in the majors since George Uhle faced 1,548 in 1923. Only two other pitchers have faced at least 1,500 hitters since 1923, Wilbur Wood with 1,531 in 1973 and Bob Feller with 1,512 in 1946. His 376 innings pitched in 1971 is the second highest in the majors since 1917. Wilbur Wood holds the modern record with 376 2/3 just a year later, 1972. Only four have pitched 350 or more innings in a season since 1929: Wilbur Wood (1972 & 1973), Lolich (1971), Bob Feller (1946) and Tiger forerunner Dizzy Trout (1944). His 29 complete games in 1971 was the highest in the AL since Bob Feller's 36 in 1946. In the 1965-74 decade, he struck out more (2,245) than any other major league pitcher. Bob Gibson was second with 2,117 during the same period. In the same decade, he was second in major league innings pitched (2,744 2/3) to Gaylord Perry's 2,978. In the same decade, he had more wins (172) than any other AL pitcher. Gaylord Perry led the majors with 182. In the same decade, he threw more complete games (155) than any other AL hurler. Gaylord Perry led the majors with 205. He is the only left-hander with three complete World Series games in the same Series. ^ a b c d e f g h i j "Mickey Lolich statistics". Baseball-Reference. Retrieved December 25, 2011. ^ a b c d e f Holmes, Dan. "The Baseball Biography Project: Mickey Lolich". Society for American Baseball Research. Retrieved December 29, 2011. ^ "1965 American League Pitching Leaders". Baseball-Reference.com. Retrieved December 25, 2011. ^ "1967: The Impossible Dream". thisgreatgame.com. Archived from the original on April 26, 2012. Retrieved December 25, 2011. ^ Dow, Bill (July 23, 2017). "Detroit '67: As violence unfolded, Tigers played two at home vs. Yankees". Detroit Free Press. Retrieved June 6, 2018. ^ "1967 American League Pitching Leaders". Baseball-Reference.com. Retrieved December 25, 2011. ^ "1968 American League Team Statistics and Standings". Baseball-Reference.com. Retrieved December 25, 2011. ^ a b c d e "1968 World Series". Baseball-almanac.com. Retrieved December 25, 2011. ^ "1968 World Series Game 5 box score". Baseball-Reference.com. Retrieved December 29, 2011. ^ "1968 World Series Game 7 box score". Baseball-Reference.com. Retrieved December 29, 2011. ^ "1968 World Series". Baseball-Reference.com. Retrieved December 25, 2011. "Workhorse Lolich could always be counted on to finish what he started"